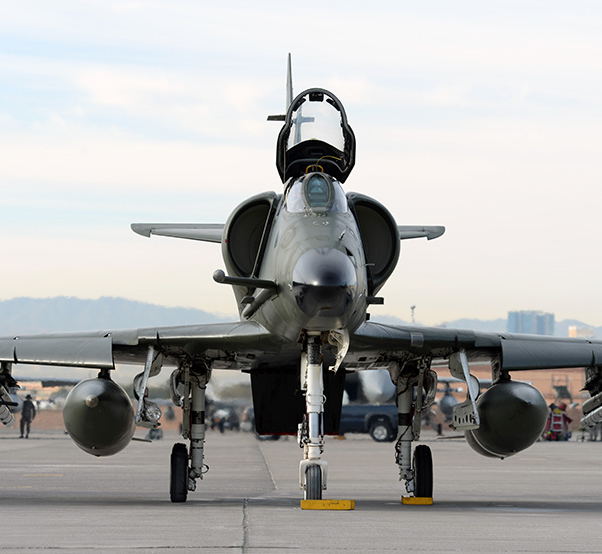 Draken International A-4 airccraft await pre-flight check on the Nellis Air Force Base, Nev., flightline Dec. 3. Draken was recently awarded a short-term contract to supplement adversary air training at Nellis AFB. Draken International, a commercial fleet of ex-military aircraft, recently won a bid for a year-long contract to provide adversary support here. Draken International is based in Lakeland, Fla., and has a fleet of more than 70 tactical aircraft. The company owns and operates the world’s largest commercial fleet of ex-military aircraft. Draken’s extensive fleet is equipped with fourth-generation technology and is flown by former and current military-trained fighter pilots. The 65th Aggressors Squadron’s inactivation in 2014 further limited the 57th Wing’s capability of providing support to training and test agencies around the Air Force and Department of Defense. Though Draken is here for adversary support, they are not scheduled to participate in Red Flag or Green Flag exercises. “We hope to support Red flag and Green Flag,” said Terry Scott, director of Nellis operations for Draken International. 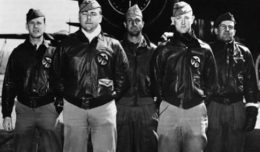 “Currently, we are supporting the USAFWS. We hope and think that in the future we will be supporting Red Flag and we’ve talked casually about that. It’s going to be determined after the trial period. A Draken International aircraft sits on the Nellis Air Force Base, Nev., flightline awaiting preflight check Dec. 3. Draken is used to support various types of military training objectives around the globe. The current contract started Nov. 30 and will go through Dec. 19. Draken was required them to have a certain number of aircraft that were readily available to deploy within 60 days of completing the contract. “Our A-4’s, we purchased from the New Zealand air force,” said Scott. “We brought them back and refurbished them. Before, the New Zealand air force had a modification and effectively what that did was put an F-16 avionics radar suite in the airplane. Employing Draken instead of using Air Force assets comes down to dollars and cents. The Air Force is able to produce three to four sorties through Draken for the same cost as one F-16 sortie. According to Shepherd, Nellis AFB is a test base to see if contract adversary air will work for the Air Force and DOD.